Hannah has been at Westminster for almost five years running the hospitality department. Getting married at the college herself back in 2016, Hannah knows the building inside out so is the perfect person to answer all your queries! Congratulations on your engagement! We are so pleased that you have shown interest in our venue! I would love to help build the wedding of your dreams at Westminster College. From our first point of contact until your big day, I will be with you every step to make sure this journey is as stress free and exciting as possible! I have been working in hospitality for over ten years in various hotel settings. I started at Westminster over four years ago as maternity cover. Fast forward to 2019, as well as being Hospitality Manager, I am the Wedding Coordinator too! I absolutely love weddings and everything about them! A lot of time is spent planning, prepping and pulling together the big day, but it really is worth it to see the smiles and laughter. The college is absolutely beautiful, and has this timeless and classical setting that draws you in. I had my own wedding here back in 2016, so I really know all the ins and outs of the building, and can offer recommendations and advice if you need it. 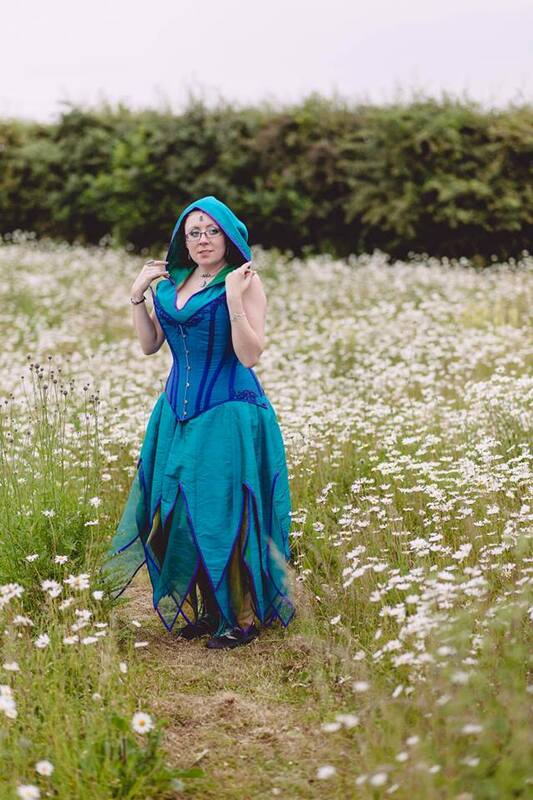 You can find some of our photos in the gallery section- but here’s a little taster! As your personal wedding coordinator, I can assist you with as much or as little as you need throughout the process. I will be there on the day of your wedding to make sure everything runs perfectly. I like to invite all couples for a coffee at the college, so we can have a casual chat about your requirements and to show you around the building. If you would like to meet, please feel free to call me on 01223 330636 or email hlp39@cam.ac.uk to arrange a date. 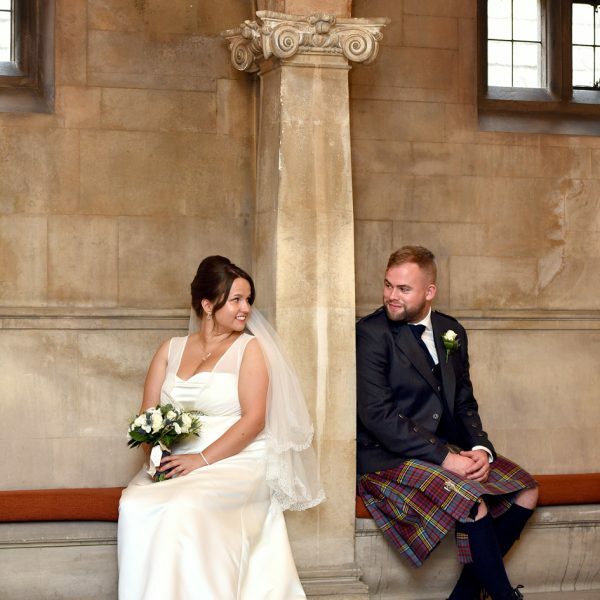 Want to find out a bit more about Weddings at Westminster? 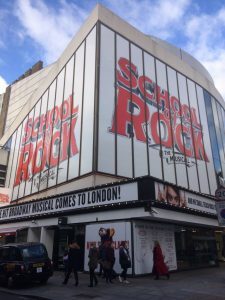 One of our receptionists, Emma Kind, was lucky enough to experience a theatre experience and hotel stay in London! “As part of our winter staff party we decided to hold a golden ticket draw, where colleague names were entered for a chance to win a free night stay in the Mayfair Hotel, London and tickets to go and see a show of your choice. To my surprise and delight, I won the golden ticket draw and was able to have 2 unforgettable experiences! For the show, I chose to see the School of Rock and it did not disappoint. The performance was full of action and life, especially when the actors played their own instruments live; it really created a concert atmosphere, which was almost like getting to see a theatre show and band perform all in one! 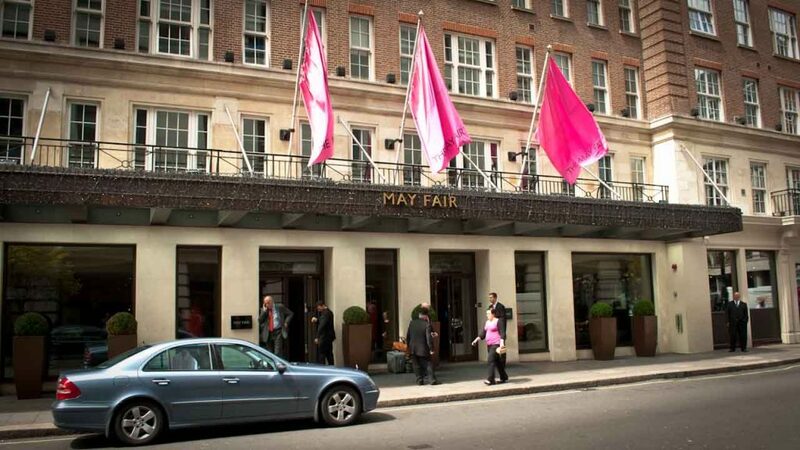 I later took my stay at the Mayfair Hotel, London, where I was greeted by the Valet as they graciously opened the door for me. 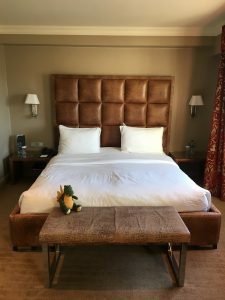 Upon checking in I was greeted with a warm welcome and directions to my room. As you will see, the room was lovely and spacious with simple but elegant furnishings. The bed was extremely soft and comfortable and the bathroom gave you a choice of either a bath or a standing shower. The view was beautiful and full of city life, and although the traffic was constant, you would think you were worlds away from the busy London centre as there was no sound from the streets at all. Breakfast in the morning was utterly delicious and I was very reluctant to leave! Employee Profile: Meet our team! 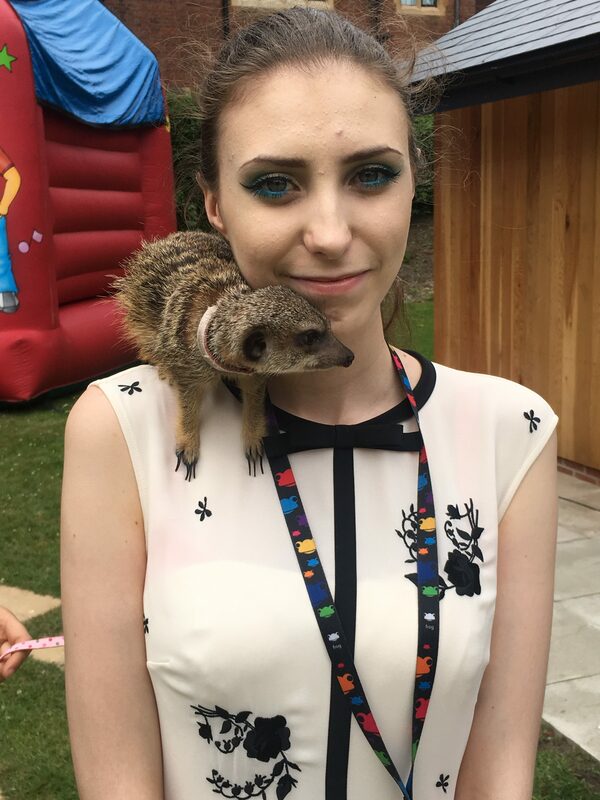 Emma at the 2017 Staff Party with Meerkat Tullulah. At Westminster we like to ensure that everyone who walks through our doors feels special, which is something I absolutely love doing. We make sure that even the smallest of things are tailored to the individual to instil a happy, positive memory. Our motive always stems from a place of care and compassion. 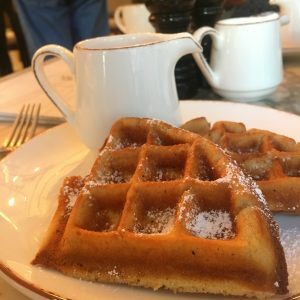 Any time I ask my Manager, Emma Brown, what I should to do to make the best decision, I often hear the words, ‘If you were the guest, how would that make you feel about that’ or ‘If you were the guest, what would you like to experience’, which helps me to make the best decision for that individual. From welcoming each and every person through our doors with a smile and genuine interest, to going the extra mile to making sure our guests have a comfortable experience and smooth journey to where ever they are setting off to next, our attention to detail makes me feel like I have been able to take any worries or possible issues that could confront our guests and help them to plan their day ahead so they are able to focus and enjoy being in Cambridge, without the worry of planning for somewhere you are not local to or familiar with. 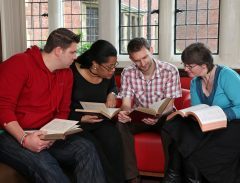 Working in a College is refreshing and means you are able to work in a real community atmosphere. Not only do you have your co-workers there for you but you also get the lovely students popping in now and then, who are always a pleasure to talk to and keep me topped up when I need a ‘pick me up’. Having such a community also makes our social events a lot more entertaining as students and staff are able to relax together and share their experiences. Our Summer 2017 summer event was really memorable for myself as we had Oreo and friends come down, where I got the pleasure of meeting Tullulah the Meerkat! (The one in the photo). 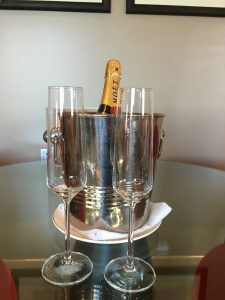 Our Winter party was also very memorable for myself as this year we had a golden ticket draw to win London Theatre tickets and a night’s stay in the London Mayfair Hotel, which I will be getting the honour of enjoying soon! An average day in Reception is never really that average! Sure you’ll answer the phone, emails and greet guests each day, but the vast differences in requests and needs of these guests are what keeps the day interesting and lively. You will get to witness and interact with some really interesting events that we get the pleasure of hosting and the multitude of fascinating people that come along with them. Reception is so diverse with different tasks we do each day, I’ve never had the threat of becoming bored or being without something to do. I often find that the time flies by and I have been able to learn new things about the way Westminster works, that allow me to keep on learning. Being in a position that deals with the Public and all manner of requests means that I experience stressful work days that can leave my brain in a bit of a whirl! However I feel it very empowering to handle with whatever comes my way, the way I feel is right for the guest and the College. It is also the indispensable fact that I have my colleagues and manager to support me all the time or to pick up where I left off, which can turn that around. The most comforting thing is having understanding colleagues who are ready and willing to help you carry the work load. If I ever have a busy shift, I know I can count on the Morning Receptionist to help me out and if I ever find myself in a unusual situation, which can be a common case in Reception, I know Emma is always there when I need some direction or have quirky issues to resolve. Above all else, seeing the relief and the smile on a guest’s face after helping to get through a rather challenging situation is well worth any added work or interesting challenges that present themselves, it really helps me to feel satisfaction within my work. Meet Igor, our Sous Chef! I moved to the UK on February the 24th of the year 2014. I began working as a kitchen porter at Westminster College. Whereas, when I lived in Bulgaria my job was to manage an automotive garage, I kept the position for 11 years before moving to the UK. I moved to Cambridge, together with my family, with the desire to offer my children the chance to receive the best education possible. When I started working, my English was at a basic level, therefore I was incredibly grateful to Westminster College for providing me with such the great opportunity of working there. Unfortunately, a few months later our kitchen’s head chef left Westminster. The kitchen was experiencing a shortage of chefs at the same time when I was asking our manager for more working hours. I was a part-time worker, which didn’t allow me to earn as much as I needed. She arranged for me to receive the training required for me to become a traditional English breakfast chef. I had never cooked before, however, thanks to the training I was provided with I learned a lot. I enjoyed learning all the new skills and providing our guests with the best catering service I could. A couple of months later I received an unexpected call from my line manager – Hannah. She asked me whether I was interested in studying a professional cookery course at Cambridge Regional College (CRC). On the next day, I visited the reception of CRC, for the first time in my life. 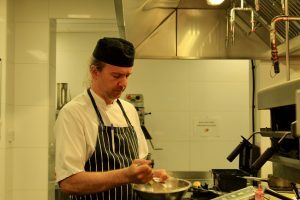 Soon after, I began my NVQ Level 2 Professional Cookery course at CRC. My biggest challenge was learning the English language, while simultaneously progressing through the course. I received a lot of support from my assessor Karen, who went through the vocabulary, grammar and punctuation with me after every cooking assessment. Fortunately, Westminster College happened to start an English course shortly after I began my course at CRC. Thanks to the extensive and helpful support provided to me by Karen, my English teacher at CRC and the English lessons at Westminster I was able to complete my course in a year and a half. I enjoyed the time I spent at CRC due to all the exciting new knowledge that I acquired. I was stunned by the amount of skills and facts that I was able to learn in such a short amount of time. Thankfully, I was granted the opportunity to practice what I was learning about. Gradually, my confidence in my own abilities grew proportionally with my knowledge. Happily, my boss, Magalie Cooper, offered me the opportunity to progress further, to Level 3. Presently, I am at the verge of completing my Level 3 course. I have completed all my paper work and all I have left to do is a few practical examinations with my new assessor, Will. In the meantime I have been promoted to CDP, and a few months after that to sous chef. I am infinitely thankful to Westminster College. Especially to Magalie Cooper, who saw the potential in me. This allowed me to develop my passion for food. I am looking forward to developing myself to become a better chef. I am grateful for being able to work in the industry, where learning never stops. I would like to express my gratitude towards the best chefs and teachers that I have ever met: Chris Burrows & Graham Taylor. 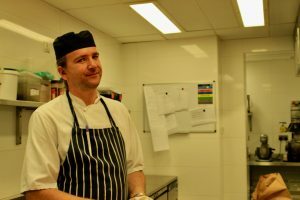 Meet Adam, our Trainee Domestic Supervisor. Westminster College for me is like a big family. What is good about a family? Every member of the family cares about each other. It doesn’t matter if it is a professional or a personal issue that you come across, you can count on your colleagues. You are heard at Westminster College. There are no bad ideas, only ideas that needs more time to put it in action. You can develop yourself in different ways because they provide the resources for that. The college appreciates hard work. I often don’t even feel like I am at work – I feel I am at a place with different people from different countries. This diversity makes us so unique, especially so close to Brexit. We work together to make everybody’s stay in Cambridge pleasant, to make a company’s conference effective and efficient, or make a couple’s wedding their most memorable day of their life. I have to say this last example is my favourite as I really enjoy working weddings. My favourite thing is going the “extra mile” for anybody. Sometimes the little things mean a lot, and I think I have good skills to detect these. Because on the end of a little effort I can see the joy and the overall satisfaction, or that small half smile what proves to me I did something right. We haven’t got average days at Westminster College. Every day is special in its own way. No day is the same, which is sometimes it is a blessing and sometimes isn’t! Obviously we have our daily routine, which starts with a nice cup of coffee and a couple of words with anybody who also needs their daily caffeine input. On a general day I supervise the catering assistants work, and make sure all of our guests get the maximum of the famous Westminster breakfast experience. Then I brief the housekeepers about their daily jobs, check conferences and B&B rooms, communicate with the kitchen, and pay maximum attention to everyone’s queries with the aim of exceeding their expectations. When I need to face any challenges I always give myself a minute or so to think it through, count from 0-10, take a big breath and go for it. Sometimes the biggest problems only require common sense and a little patience to solve them. Although this is not always the case, for instance when there’s a lack of ice 5 min before the disco kicks off with an open bar! In these cases you need to think very quickly, step up effectively and act straight away. But I have an ultimate weapon against anything that is always with me, it is free and inexhaustible: a smile!!! It might not solve the problem but it still feels good to do. Thinking of Westminster College as your future employer? We thought it would be nice for you to meet all our support team, and show off all the amazing things they do for the college and why they like working here! 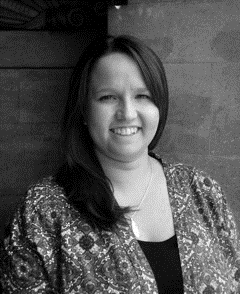 Meet Emma, our PA to the Bursar and Office Manager. It’s a bit of a mixed blessing this one! As a relatively small organisation, we’re quite a tight knit family and it means we all pitch in wherever help is needed; many of us hold more than one title, and those who do have one title have a fairly diverse set of things to do. Those of us who’ve been around for a few years have knowledge about things which might not be anything to do with our job title. If something needs to get done, we’ll find a way of doing it, and doing it well. Working for a non-profit organisation. Any surplus is invested back into either the people or the building. I’m really proud of that; it makes the occasionally long, challenging days very worthwhile. Every penny we make enables us to invest in the future. We’re very much an equal opportunity employer. We’ve a very diverse team here, with people from a multitude of countries, all bringing their own unique experiences to add to the Westminster experience. 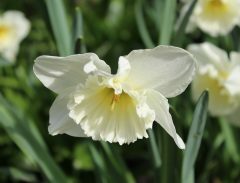 The thing which stands out most for me, as a woman in management, is that our current management team has more women than men – that is unusual even in these times, but most particularly in a Cambridge college. We invest in our people, so it is natural to see internal promotions or transfers; I started as a temp for 2 weeks. 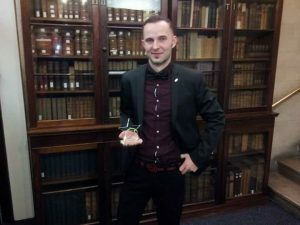 Since then, with my most recent role change being from PA to the Principal to PA to the Bursar back in October 2015, I’ve had quite a few changes within what I do as part of my dual roles of Office Manager and PA as the college and the team have grown. I’m also really proud to work for an accredited Living Wage Foundation employer, which is one of only two Cambridge colleges which pays the Living Wage, as set out by the Living Wage Foundation. That’s phenomenal! We don’t “do something that way because it’s always been done that way”. It’s important that we acknowledge our history and legacy – why we’ve done something that way before – but it’s also important to constantly reform. Both as part of the United Reformed Church, and as a forward thinking organisation! I started here when we had 2 full time members on Reception (including me), opening the building at 8.30am and closing up as we left at 4.30pm, closed at weekends. We’re now open 7am to 11pm, seven days a week and I manage a team of 5 to cover reception. Back when I started, we didn’t have any en-suite bedrooms – it was all shared facilities along draughty corridors – and our building was beautiful but in need of some serious updating in many different ways. After raising £7 million, we underwent a major building refurbishment and we’ve now got 38 bedrooms and 2 cottages, all en-suite. Gone are the days where we had an occasional overnight guest alongside our students. The extra income from B&B goes back into keeping Westminster sustainable for our students and the URC, and into ensuring we look after our Grade 2 listed building – she’s a gentle creature and we need to nurture and protect her! There’s no such thing! 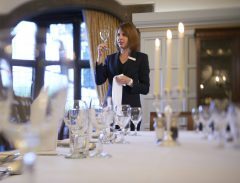 I oversee Reception, and whilst we certainly have daily tasks to do, our focus is customer service, be that interactions with our students as they collect their post, welcoming in a contractor arriving to service a piece of plant, directing conference delegates to their meeting room or checking in our B&B guests. People, by their nature, are all different and have different needs and expectations. We try to anticipate what they need and exceed their expectations. That, in turn, makes every day different. Then we get queries and challenges that, even with 8 years under my belt, haven’t come up before. They do happen to us all occasionally! I try to do three things. Firstly, look back to my very first day and remember how many positive changes we’ve been through. Even the very hard changes have lead to new opportunities that we might not otherwise have had. Secondly, I spend a moment just quietly in our stunning chapel. I’m not a Christian, but I’ve always adored churches and cathedrals, and simply being in such a beautiful, spiritually rich space recharges the batteries. Thirdly, I visit the sisters. They were rather phenomenal women with a very quirky, rich history and fascinating lives. 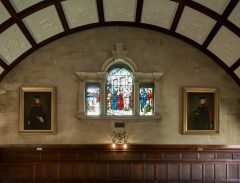 Their portraits hang in our Dining Hall, so we eat with them looking over us most lunch times. In a world which didn’t allow them to attend university or get a degree, they let very little hold them back from doing exactly what they wanted to; i.e travelling through the desert on camel back fully garbed in their Victorian outfits, complete with their china tea set. I visit them because I like to think that we continue their legacy. They would certainly not have let a singular tricky email (letter?) or long, difficult meeting get to them so why should I? Keep up to date with our blog to meet more of our team!